Some of our stock items are close to sell by dates or wines may be from last year, however none of this makes any difference to your ultimate enjoyment. We con not guarantee to have a particular wine in stock all year round, we do update our beer, lager and wine for sale on our website frequently, but when it's gone it's gone! Beer and Lager for sale from major brand names i.e. Guinness, Caffreys, Boddingtons, Courage, John Smiths, Scottish & Newcastle, Ruddles, Tennants, Tetleys, Theakstones, Budweiser, Becks, Carling, Carlesberg, Fosters, Grolsh, Heineken, Kronenbourg, Stella Artois, Oranjeboom and Skol. Cider for sale from major brand names i.e. Blackthorn, Bulmers, Magners, Kopparberg, Scrumpy Jack, Strongbow and Woodpecker. Wine for sale from major brand names i.e. Banrock Station, Blossom Hill, Cape Grace, Don Simon, Echo Falls, Ernest & Julio Gallo, Hardy's, Jacob's Creek, JP Chenet, Kumala, Lindemans, Oxford Landing, Paul Masson, Rosemont, Stowells, Wolf Blass, Black Tower, Blue Nun, Don Luciano, Kumala, Penfolds, Sutter Home, Willow Creek, Wynns and Zaximus. We specialise in the retail sale and distribution of beer, lager, cider and wine. This should be at least DOUBLE the price. 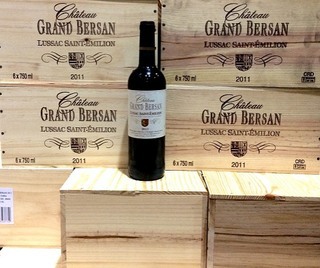 Lussac-Saint-Émilion is an Appellation d'origine contrôlée (AOC) for red wine situated in the Bordeaux wine region. The appellation is located on the right bank of the Garonne and Dordogne rivers, about 45 kilometres (28 mi) from city of Bordeaux or 9 kilometres (5.6 mi) from the medieval village of Saint-Émilion. It is one of the so-called "Saint-Émilion satellites" situated around the appellation Saint-Émilion AOC itself. vats. Daily pumping over. Ageing in stainless steel vats. It is against the law for anyone under 18 to buy alcohol in a pub, off-licence, supermarket, or other outlet, or for anyone to buy alcohol for someone under 18 to consume in a pub or a public place.